250 Custom Rectangle Stickers, prices starting at $99.56. Rectangles are a classic, and well known shape for custom stickers. This shape works excellent for printing up a logo nicely framed in a small rectangle that you can hand out at an event. It’s also a well known for the classic bumper sticker shape that has been popular for decades. 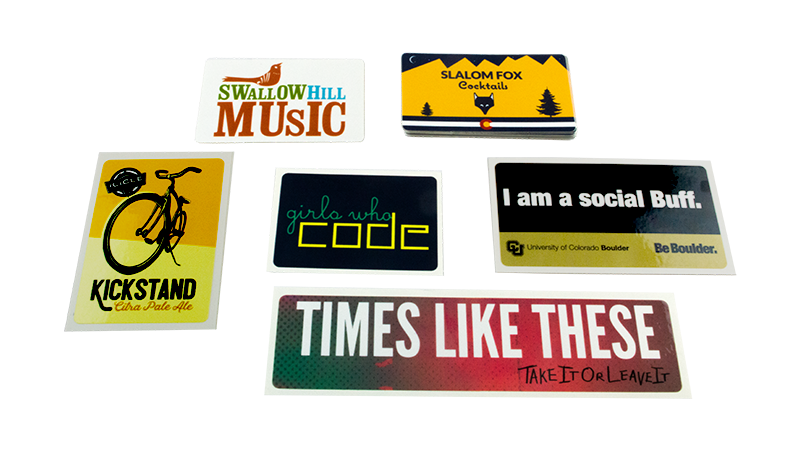 Digitally printed rectangle stickers are printed with full color to print your designs with a high quality finish. All of our custom stickers are available with Free Shipping! Rectangle stickers are outdoor durable for sharing and sticking just about anywhere. Digitally printed rectangle stickers are finished with rounded corners for a long lasting application. Your stickers can be printed for vertical, or horizontal designs, and the dimensions of your custom rectangles can be cut to any sizes up to 11x14 inches. Ths means your custom rectangle stickers can be sized to match your design, whether that is a long skinny vertical piece of artwork, or a short and wide rectangle featuring your brand or logo.